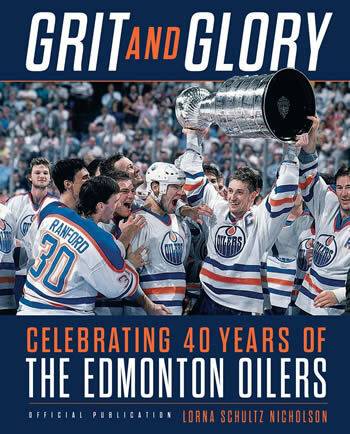 If you are a fan of the Edmonton Oilers, it's a pretty good bet that you either already have the beautiful new book, Grit and Glory: Celebrating 40 Years of the Edmonton Oilers, or are expecting to get it soon, perhaps via Santa Claus. It's Lorna Schultz Nicholson's name on the cover as the author, but a book like this takes many teammates to make happen, especially as it is an official team publication. Playing along with team history, if Schultz Nicholson is Wayne Gretzky, centring the winning project, then editor Justin Stoller was her Jari Kurri, there at her side for much of the journey. About four years ago, Schultz Nicholson made the initial proposal for the book, which in retrospect, was “sparse and not totally fleshed out.” She got the go-ahead in February 2016 from Viking, the division of the giant Penguin Random House behind the 320-page treasure. Then it was on to the interview process, starting at the beginning, with Al Hamilton and the WHA days of the team (the book marks 40 years since the team joined the NHL in 1979, in case your math is spotty). Research included reading many previous Oilers-related books, such as Boys on the Bus, Oil Change and autobiographies, as well as watching tons of past games on video. Complimenting those season by season stories of the action on and off the ice are some incredible phots, and some really neat sidebars—like the tale of the Bub Slug comic strip, flight woes, Stanley Cup celebrations, retirements of players and broadcasters, and other honours, such as number retirements and Hockey Hall of Fame inductions. Because Grit and Glory is an official publication, Schultz Nicholson worked doubled-shifts to make sure everything was on target, and it went past a few extra sets of eyes who had investments in the team along the way, emotionally and financially. To its credit, Grit and Glory does not come across like any sort of a white-washed company book-length press release, sticking only to team-approved narratives, and avoiding all controversy. 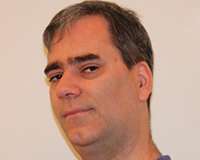 A little like his subject matter, writer Gregg Inkpen is unapologetic and honest. 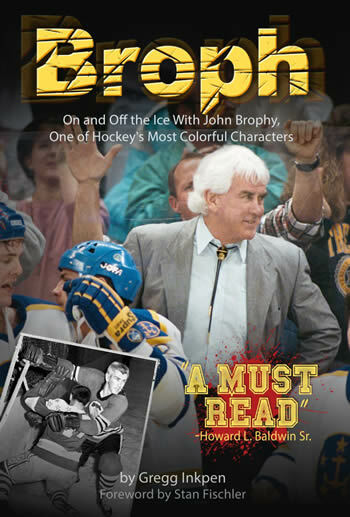 His self-published book about tough guy turned coach John Brophy, entitled Broph: On and Off the Ice With John Brophy, One of Hockey's Most Colorful Characters, just went to press and Inkpen is straight-forward with his goals. “I'm shameless. I want people to read it. I'm making just under $2/book so it's not about the money,” he said via email. Since it came out through Amazon's KDP system (formerly known as Createspace), a little later than planned, just before American Thanksgiving at the end of November, Inkpen can keep track of sales in a way that writers with traditional publishers cannot. Back in April 2018, I previewed the project. Inkpen said that the process worked smoothly from his perspective, learning about “bleeds” and PDFs over a Word doc along the way. He's pleased with who he did get to talk to, including past interviews with Brophy himself, teammates and players, but there's always a “What if?” Inkpen wishes he could have talked to former Leafs scout and GM Gerry McNamara, and the recently deceased Dan Maloney. Inkpen will be out there hustling the book. Besides social media, such as Twitter and Facebook, the local paper in Long Island near where Inkpen lives and where Brophy played has done a bit to promote Broph. He has reached out to other places where he coached, like Hampton, Virginia, and Toronto too. “I also had business cards made with the book cover as the photo on the card. When I go to the Nassau Coliseum for an Islanders game or two (they're back for a few games), I'll strategically place them around the arena and maybe onto windshields of parked cars,” warned Inkpen. I have been trying to work ahead a bit on this column, since I just fit it in where I can, and can say we're going to finish off 2018 with an interview with the bestselling Kirstie McLellan Day, about her book, Cujo, with Curtis Joseph, and all those other big winners through the years.